Whether you’re testing out a new operating system, keeping a substitute/backup operating system or just using it to run another environment like Linux, dual boot is a very powerful feature. But once you’re done with the secondary operating system how do you get rid of it without leaving any trace? Even if you just delete the Windows folder you probably still see the dual boot prompt at boot. So here’s how to remove dual boot in Windows so that your primary operating system doesn’t get conflicted! If you’ve properly installed a second operating system on your computer, there’s probably a folder containing its files on a separate partition. First step of getting rid of the second OS is as simple as deleting that folder. If you’ve been really smart and also installed all programs for that operating system in another partition, away from the program files of your primary operating system, then it’s wiser to just format that partition. In case your program files are mixed up, you will have to manually delete them. Step 2: Click Run (in case of Windows XP, Vista and 7) or right click the bottom left corner and click Run (in case of Windows 8). Step 4: Go to the Boot tab. You should see your operating systems listed, with one being the Default OS. If the Default OS isn’t the one you want, simply highlight your primary OS and click “Set as Default”. Step 5: Now highlight your secondary OS and click “Delete”. 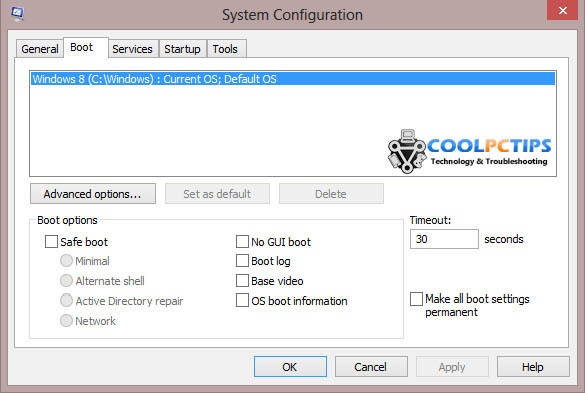 That’s it, now your PC won’t prompt on boot to select an operating system. You can also use this menu to change how much time the OS select screen is displayed. Let us know if you have any other queries on how to remove dual boot in Windows and of course, comments and suggestions are welcome! Thanks for sharing this and saving a lot of headache. Never knew it was this simple before!! can u let me know if there is ny thing similar to this post in linux ???? You mean Linux as primary or secondary? Hello Rahul, nice tutorial bro. In fact i was looking for the same tutorial. I searched a lot but did not found any good tutorial. More than 1 OS in windows PC kills time and frustrate me a lot. Thanks a lot. Thank you sir ,I also tried it working fine. And still one appears during your boot? Which one?